Peter Yost led the Free Evangelical Brethren Church from its organization in December 1900 until his death in 1927. According to the church records, Elder Brother Yost was chosen to lead the congregation by casting lots to make a fair selection. After his selection there was a laying on of hands, a symbolic and formal method of invoking the Holy Spirit during an ordination of church leaders. A second Elder, Brother Heinrich Hagelganz, was elected and joined Brother Yost in a co-pastorship in 1907. Neither Heinrich Hagelganz or Peter Yost were ordained ministers at this time. Peter Yost (Jost) was born in Norka, Russia on July 4, 1850, the son of Heinrich and Christina (Sauer) Yost. He was confirmed in 1865 by Pastor Bonwetsch in Norka. On February 11, 1874, Peter married Elizabeth Nolde, born March 30, 1852 in Norka. Three children were born in Norka: Ludwig (March 11, 1876), Heinrich Peter (October 14, 1878) and Heinrich (March 5, 1883). Yost was an adherent of the Brethren movement in Russia which was particularly strong in Norka due to the support from Rev. Wihelm Stärkel. Peter Yost arrived in the United States on December 12, 1889 with his wife Elizabeth (Lizzie) and sons. A daughter, Katharina (Katie), was born on June 22, 1890, shortly after their arrival in Sutton, Nebraska. Peter and Lizzie soon moved to Portland where they arrived September 29, 1890. In 1891, they are listed in the Albina City Directory at the same address as Peter and Mollie Wolf who were also from Norka. The Yost's became charter members of the Ebenezer German Congregational Church in 1892. They remained part of this congregation for many years until resigning to form the Free Evangelical Brethren Church in 1900. Peter and his brother Conrad Yost, who also lived in Portland, were among the ministers and delegates that organized The Pacific Conference of German Congregational Churches. The Conference, covering the states of Oregon and Washington, was founded on March 5, 1897 at the Ebenezer German Congregational Church in Portland. Also attending from Portland was Rev. Johannes Koch and John Krieger. The Yost family was living at 827 Union Avenue from 1900 through his death in 1927. Peter is shown as a day laborer in 1900 and a shoemaker in 1910. In 1910, Peter's daughter Katharina (Catherine) married to Gottfried Geist and they are living with Peter and Lizzie. 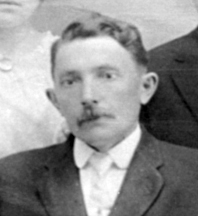 Peter's son, Peter A. Yost (a butcher), is married and living with his wife Nellie on Michigan Avenue. By 1920, Peter is no longer employed at age 69. Peter Yost died at his home on Union Avenue on June 4, 1927. A funeral service was held at the Ebenezer German Congregational Church on June 6th. Peter is buried with his wife Elizabeth at the Rose City Cemetery. Kniss, Conrad. "History of the Free Evangelical Brethren Church." Free Evangelical Brethren Church Records 1900-1922. Portland, OR: 341-42. Print. Krieger, Joanne, trans. Ebenezer Congregational Church, Portland, Oregon 1892-1908. Portland, OR: n.p., 1999. 18. Print. "Funeral Notices - Yost." The Oregonian [Portland], June 5, 1927, pg. 3. Last updated November 8, 2017.